We have all seen so many pictures of him we know him as well as Arkle or Rock of Gibraltar by now. The white horse of Lascaux, painted 20,000 years ago and still running, no doubt with some caveman gambler’s prize axe on his nose. He was found in Lascaux, and although the original cave was closed, the reconstruction near the original site, in the suburbs of Montignac, is one of the great family attractions in France. The Dordogne River has blessed the valley through which it runs with one of the best reputations for tourism in France. Southeast of Bordeaux and north of Tours, it requires an overnight stop from the ferry on either the Vendee coast or the Loire valley, which is a decided advantage. When you get there, a surprise. The Irish, Dutch, and especially the British have already fallen in love with the place. In the heat of the summer of 2003 the Dordogne was like a liquid M50. As you plunge and splash you are passed by hundreds of canoeists, kayakers, and people who looked like they weren’t sure why they should be there. The shoaly bays at the riverside are packed with swimmers and picnickers, each scene looking like a Cartier-Bresson photo. 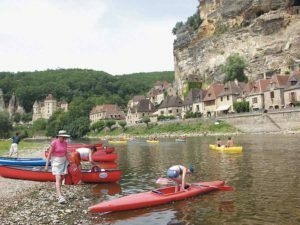 It is still a myth that the Dordogne is packed with Brits, there are plenty but hugely outnumbered by French holidaymakers. But the French have a point to make. “If you want chips we know a good place in Belgium,” one menu sternly warns. In summer, Sarlat, the main town, is a permanent traffic jam. But when the sun goes down, the buskers come out, the tables outside the restaurants fill up and the theatre festival gets under way (every French town has a street festival or fireworks display, it’s as natural as Theirry Henry scoring goals). The best meals you will get are in the villages around Sarlat, especially the village marche. The French think that markets are a sort of flag waving exercise for local produce, however they manage to convince Brussels to allow them do it, and the result is worth the 900-mile drive. At St Genie you sit in the middle of the town square on makeshift tables, eating magnificent duck (mainly duck, cooked in a huge variety of ways), wine, cheese and truffles. When you get your truffle you know why they use pigs to retrieve them. They look like dog turds. They taste heavenly. If you want a slower, deeper, fuller emptier river, drive down to the Lot. It could be the next big destination. Dordogne’s selection of four star campsites are situated within easy reach of the region’s attractions. The sites are elevated, well equipped with separate adult and child pools, and utilise farms which have already been planted with trees to provide the sort of shade a high summer in southern France requires. Canvas Holidays has four sites, located discreetly off the road in old farmhouses, sometimes with their original farm buildings intact. Camping La Bouquerie and Domaine de la Paille Basse near Souillac are managed in a low-key fashion which suits families, with lots of onsite activities you won’t find close to home like boules and archery. The campsites attract a large number of French visitors as well, which leads to the sort of cultural inter-action from which children will benefit.